You will love our Modern Blank Firing guns for Movie prop blank shooting guns, stage prop blank firers, Reenactment blank firing guns. We have front firing blank guns as well as the usual top firing blank guns. We have 8MM blank guns, 9MM/380 Blank firing replica guns, 9MMPA Blank guns, Jackal Fully automatic blank gun, Fully Automatic Machine Guns Pistol, Beretta PX4 or P4 Storm Blank Gun Replica, ASI UZI Blank Firing or UZI blank firing gun, Beretta V85 9MMPA Replica blank firing guns, Beretta M92 8MM or V92 9MMPA blank firing gun replica, Beretta M92F fully automatic blank firing guns replica, P229 or P29 blank firing guns, ARAS Blank firing guns, Colt .45 1911 blank firing guns, P99 Blank Firing Gun and Sava blank guns. View several pages by changing pages at the bottom of each page. 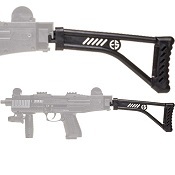 This is the Folding stock for our Blank Firing UZI. The price is for the STOCK ONLY.